The Trek 820 is an excellent entryway to a world of off-road adventures. It's the most ideal choice for beginners who are interested in the MTB life but also want a hybrid bike that's as equally suited to light trails as it is to potholed city streets. Color subject to change. The Trek 820 WSD is an excellent entryway to a world of off-road adventures. 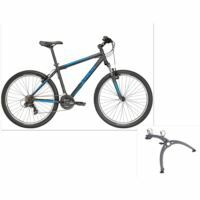 It's the most ideal choice for beginners who are interested in the MTB life but also want a hybrid bike that's as equally suited to light trails as it is to potholed city streets. Color subject to change. 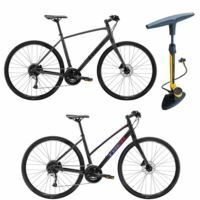 The Trek Verve 3 and Verve 3 WSD are the perfect balance of performance and comfort in a single hybrid bike. They're ideal for comfortable rides on roads, paths, and city streets. The highest-end model in the Verve family features a relaxed upright geometry, 27-speeds, a padded saddle, wide tires for extra stability, and vibration-taming IsoZone handlebar and grips. 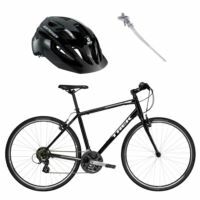 Bell's Radar bicycle helmet features True Fit - Just one simple adjustment for a correct fit every time -Ten top vents and three rear vents make for a cool ride. Color(s) subject to change. Wear it and believe. The Bontrager Solstice Helmet is proof you don't have to spend a lot of money to get a great fitting, easy-to-use cycling helmet designed to keep you protected during all your bike riding adventures. Topeak's Joe Blow Sport bike pump sets the standard for affordable performance. It quickly inflates tires with a sturdy steel barrel and base, a tight-sealing aluminum thumblock head that fits Presta and Schrader valves. With the Doberman, all you need is your bike, the lock, and a number you can remember - no keys necessary! Wear it and believe. The Bontrager Solstice Helmet is proof you don't have to spend a lot of money to get a great fitting, easy-to-use cycling helmet designed to keep you protected during all your bike riding adventures. A must have to keep your bike off the ground and looking brand new! Standard size that fits almost any bike! Flats happen. Make sure you're prepared with a Bontrager Flat Pack, a convenient and useful all-in-one pack containing tire-change essentials. Featuring the storage, inflation, and tire removal equipment you need to handle an emergency repair. OnGuard's Doberman combo cable lock is tough and easy to use! With the Doberman, all you need is your bike, the lock, and a number you can remember - no keys necessary! Wear it and believe. 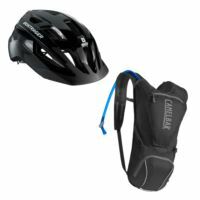 The Bontrager Solstice Helmet is proof you don't have to spend a lot of money to get a great fitting, easy-to-use cycling helmet designed to keep you protected during all your bike riding adventures. The all new Camelbak Rogue features the convenience of external fill in a sleek bike pack. The 2.5L Crux reservoir can be refilled on the fly via the quick-release flap on the front of the pack. The Trek 820 is an excellent entryway to a world of off-road adventures. It's the most ideal choice for beginners who are interested in the MTB life but also want a hybrid bike that's as equally suited to light trails as it is to potholed city streets. Bell's Radar bicycle helmet features True Fit - Just one simple adjustment for a correct fit every time. OnGuard's Doberman combo cable lock is tough and easy to use. Standard size kickstand that fits almost any bike! Every rider needs one of these to stay hydrated on the go! Color(s) subject to change. The Trek 820 is an excellent entryway to a world of off-road adventures. 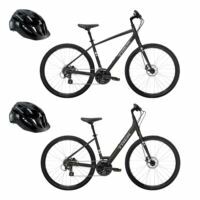 It's the most ideal choice for beginners who are interested in the MTB life but also want a hybrid bike that's as equally suited to light trails as it is to potholed city streets. The Saris' Bones 2-Bike Trunk Rack is easy to use and just plain cool. Plus, it easily adjusts to fit most vehicles from sedans to minivans, even hatchbacks and cars with spoilers! Color(s) subject to change. The Trek Marlin 4 is the perfect gateway to trail riding. 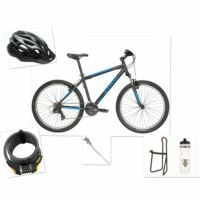 It's ideal for new riders who want a mountain bike with knobby tires that can double as a rugged commuter. Disc brakes, front suspension, 21-speeds, and mounts for a rack and fenders make this versatile ride an excellent entry point for new trail riders. 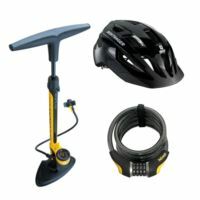 Bell's Radar bicycle helmet features True Fit - Just one simple adjustment for a correct fit every time. Every rider needs one of these to stay hydrated on the go. Standard size kickstand that fits almost any bike! Color(s) subject to change. The Trek FX 3 is a workhorse hybrid bike that offers the speed of a road bike, the versatility of a city bike, and the comfort of a fitness bike. A lightweight Alpha Gold Aluminum frame, a carbon fork, and a performance drivetrain make it a speedy, versatile, dependable ride. 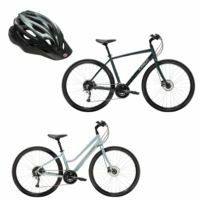 Bell's Radar bicycle helmet features True Fit - Just one simple adjustment for a correct fit every time -Ten top vents and three rear vents make for a cool ride. The BiKASE Handy Andy Easily mounts to bike with 2 neoprene straps. Color(s) subject to change. 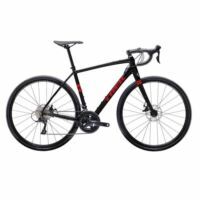 The Trek FX 3 and FX 3 WSD is a workhorse hybrid bike that offers the speed of a road bike, the versatility of a city bike, and the comfort of a fitness bike. A lightweight Alpha Gold Aluminum frame, a carbon fork, and a performance drivetrain make it a speedy, versatile, dependable ride. 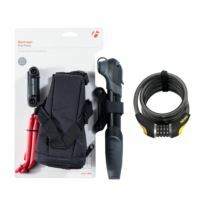 Topeak's Joe Blow Sport bike pump sets the standard for affordable performance. It quickly inflates tires with a sturdy steel barrel and base, a tight-sealing aluminum thumblock head that fits Presta and Schrader valves. Color(s) subject to change. The Trek Verve 2 and Verve 2 WSD is a hybrid bike for commutes, cruises, and fitness rides. 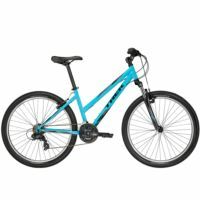 It has a lot of details that make for a comfortable ride, like a padded saddle, suspension seatpost, adjustable stem, and wide tires for extra stability. 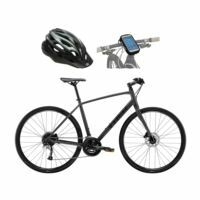 Bell's Radar bicycle helmet features True Fit - Just one simple adjustment for a correct fit every time -Ten top vents and three rear vents make for a cool ride. Color(s) subject to change. Whether you're cruising to work or play, Trek's FX is a bicycle you'll love. 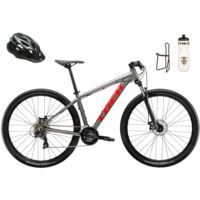 Its Alpha-Silver aluminum frame is lightweight for easy pedaling and the fast-rolling 700c wheels let you ride further and faster. 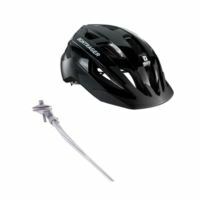 The Bontrager Solstice Helmet is proof you don't have to spend a lot of money to get a great fitting, easy-to-use cycling helmet designed to keep you protected during all your bike riding adventures. Standard size kickstand that fits almost any bike! Color(s) subject to change. The Trek Checkpoint AL 3 is an exceedingly versatile bike designed to suit a wide variety of ride styles including gravel rides, bikepacking, and daily commutes. The masive tire clearance means that you can use tires up to 35c for extra traction and stability in any condition. Mounts on the seat tube and both sides of the down tube make it easy to carry extra gear and water. Color subject to change. 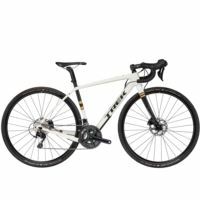 The Trek Checkpoint AL 4 is an exceedingly versatile bike designed to suit a wide variety of ride styles including gravel rides, bikepacking, and daily commutes. The masive tire clearance means that you can use tires up to 35c for extra traction and stability in any condition. Mounts on the seat tube and both sides of the down tube make it easy to carry extra gear and water. Color subject to change. The Trek Checkpoint ALR 4 is an aluminum gravel bike that offers an incredible amount of capability for the price. It's built for the rigors of gravel and dirt roads, but it's also right at home on morning commutes and centuries. This bike knows no boundaries, which makes it the ideal gateway to adventure on any road or path. Color subject to change. The Trek Checkpoint ALR 4 WSD is an aluminum gravel bike that offers an incredible amount of capability for the price. It's built for the rigors of gravel and dirt roads, but it's also right at home on morning commutes and centuries. This bike knows no boundaries, which makes it the ideal gateway to adventure on any road or path. Color subject to change. The Trek Checkpoint SL 5 is a carbon gravel bike made for epic all-road adventures. It's built with a full Shimano 105 drivetrain and hydraulic disc brakes, but the defining feature of this model is the lightweight OCLV Carbon frame with IsoSpeed, a decoupler at the top tube/seat tube junction that provides additional compliance over rough terrain so you can stay stronger longer. Color subject to change. The Trek Checkpoint SL 5 WSD is a carbon gravel bike made for epic all-road adventures. It's built with a full Shimano 105 drivetrain and hydraulic disc brakes, but the defining feature of this model is the lightweight OCLV Carbon frame with IsoSpeed, a decoupler at the top tube/seat tube junction that provides additional compliance over rough terrain so you can stay stronger longer. Color subject to change. The Trek Crockett 5 Disc is the perfect introduction to the world of cyclocross. It's designed with cross-specific details, like a 1x11 drivetrain and a lightweight frame that's easy to carry over barriers, but it's so much more than just a cyclocross bike. It's equally at home on gravel and your morning commute as it is on the cross course. Color subject to change. The Trek Crockett 7 Disc is the Swiss Army knife of cyclocross bikes. Ride it to a cross race, podium, then comfortably take the gravel roads back home-all on a bike with a high-quality build that can stand up to any other bike on the course. If you're looking for a cyclocross bike that does it all and does it well, you're in the right place. Color subject to change. The Trek Domane AL 2 is the perfect gateway to comfortable road biking. It's stable, light, easy to accessorize, and fun to ride-all of which makes it the ideal choice for anyone looking for a great first experience with a real road bike. Color subject to change. The Trek Domane AL 2 WSD is the perfect gateway to comfortable road biking. It's stable, light, easy to accessorize, and fun to ride-all of which makes it the ideal choice for anyone looking for a great first experience with a real road bike. Color subject to change. The Trek Domane AL 3 is smooth, stable, and confidence-inspiring. 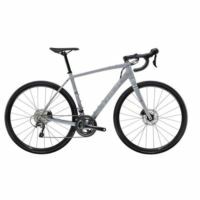 It's perfect for new riders and anyone looking to upgrade to a versatile aluminum road bike built for a comfortable riding experience. The quality parts are ready to tackle fast group rides and adventures that stray from the beaten path to rougher roads.. Color subject to change.